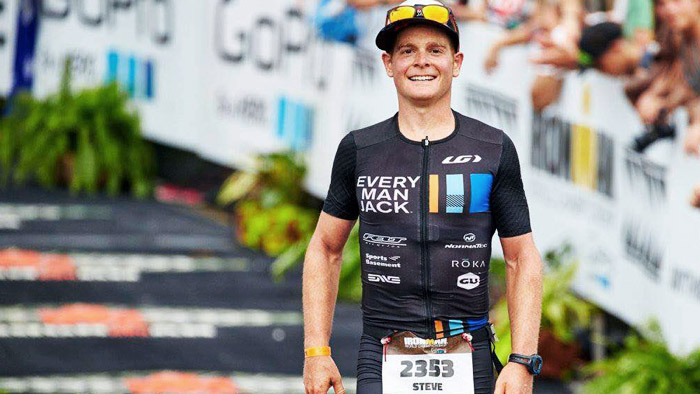 At the 2015 IRONMAN World Championships, 23 year-old Steve Mantell placed 2nd in the 18-24 age group and was the 8th place amateur overall. Despite being an IRONMAN World Championships rookie, Mantell displayed patience and discipline as he stuck with his race plan despite what others were doing. Mantell qualified for Kona at IRONMAN Florida in November of last year, his first IRONMAN, and went 8:20:22 (the swim was canceled). He also raced at IRONMAN Boulder this year, where he finished in 8:54:04 placing him 1st in the age group and 2nd overall. Mantell set up his Kona power plan with the help of his coach Jon Mason of MP Multisport. Performing regular Functional Threshold Power (FTP) tests allowed them to create an optimal racing plan. For Kona, Mantell had a planned wattage range of 220 to 250 watts. Along this same section of the Queen K, Mantell put his power out in an even fashion, as shown by his Variability Index® (VI®) of 1.01. This means that rather than surging and slowing, Mantell’s output is even and steady. This is the most efficient way to ride, and a VI of 1.05 or less is the goal for any IRONMAN course. On the climb to Hawi, Mantell pushed his wattage to 235, still with room for the upper end of his goal. Even with the bump in effort Mantell felt in control and kept his heart rate under 160bpm to help avoid overheating. After getting his special needs and making a quick pit stop, Mantell encountered the legendary crosswinds that often wreak havoc on those who have gone too hard too early. With energy still in the tank, Mantell used the rolling hills along the Queen K to gain some time on his competitors. Viewing the same 45 mile section from his ride out, on the way back to Kona Mantell’s power does drop slightly to 216 AP and 221 NP. This is a very minimal drop in power. To go with that, his VI only bumped up to 1.02, meaning he was still very smooth with his effort and did not need to rest on any downhills. His patient strategy, strength, and good decision making helped Mantell bike a 4:45:32. His overall metrics of an IF of .73 and VI 1.03 are right in the range of what a top age group male should have. But while he had a strong bike, the marathon was still to come. View Mantell’s full power file. Mile after mile, Mantell ran a 7:00 to 7:05 pace despite the heat and rolling terrain. Amazingly, his fastest mile split comes at mile 22 when he ran a 6:54 mile. Solid training and an incredibly well executed race plan allowed Mantell to close with a 3:04:40 marathon. View Mantell’s full run file. Mantell’s race strategy is one that many athletes would benefit from emulating. Having a specific plan in place for each segment, and having the willingness to stick with it no matter what will always deliver the best results. His patience on the bike and gamble that he would be able to run down other athletes paid off in a big way. While many athletes understand this race plan, many fall short in executing it.